PDF Repair Tool supports Windows Operating System 8.1, 8, 7, XP, etc. No matter what was the concern due to which PDF file gets damaged, all the issues will be resolved with the use of this PDF repair tool. Tool will not destruct the basic features of the application. It not only repair minorily corrupted PDF document, but also severely damaged PDF fileS and allows to save healthy PDF at user-defined location. Tool repair corrupt PDF files without any flaw. When there is an issue just because of confronting error, while working with PDF files. Then, the tool will work for sure instead of making any distraction. 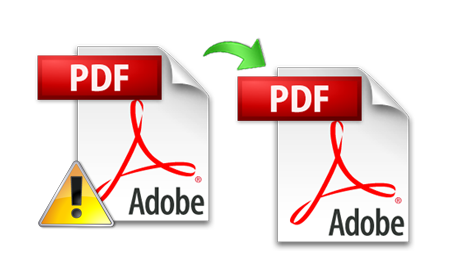 Moreover, users can fix all error based issues by repairing damaged PDF files. PDF Recovery Tool repair all PDF components and helps in the extraction of data items such as graphics, image forms, images, hyperlinks etc. As a result, the concern associated to internal elements will also be resolved by the tool. Files can be easily recovered without compromising on data. Tool is useful when your concern is all about to recover PDF file within minimal time investment & to maintain the data integrity. Also, components like images, hyperlinks, graphics and text information will be recovered without any data loss and integrity. The requirement to store portable document data after winding up corrupted PDF file recovery will be furnished by the software. PDF Recovery Tool doesn't replace corrupted PDF file after recovery rather; the recovered PDF data is stored as a new PDF document. There is no need to get worried about recovery just because of Windows OS edition. For earlier as well as old versions of Windows OS like 10, 8.1, 8, 7, etc PDF Recovery software is compatible. However, users should have Adobe Reader on the recovery machine. How PDF Repair Tool recover damaged PDF files? 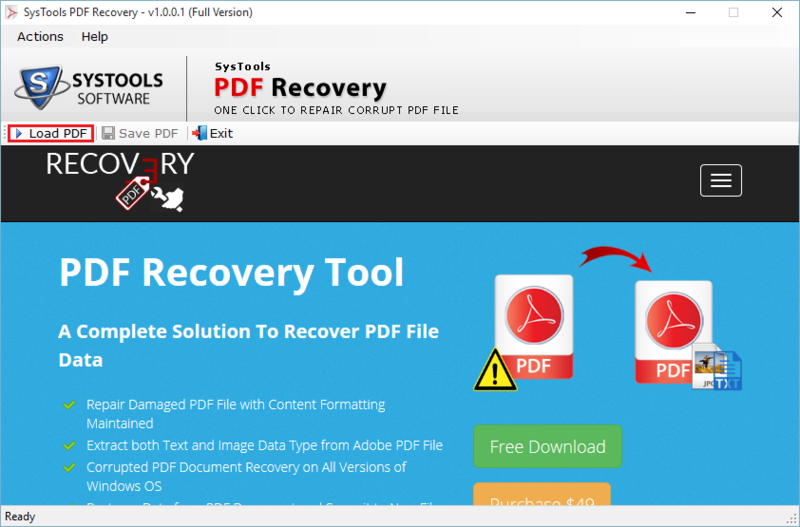 Can I recover corrupt PDF files with PDF Recovery tool? Yes, Corroupt PDF Repair Tool is capable to repair damaged PDF files and exports them into new healthy PDF file format. Is it possible to Extract Text and Images from a corrupt PDF file? Can I use PDF repair tool to rescue damage PDF file? Yes, it is possible to extract data from PDF files by PDF Repair tool. Does this software is compatible with latest version of PDF file? 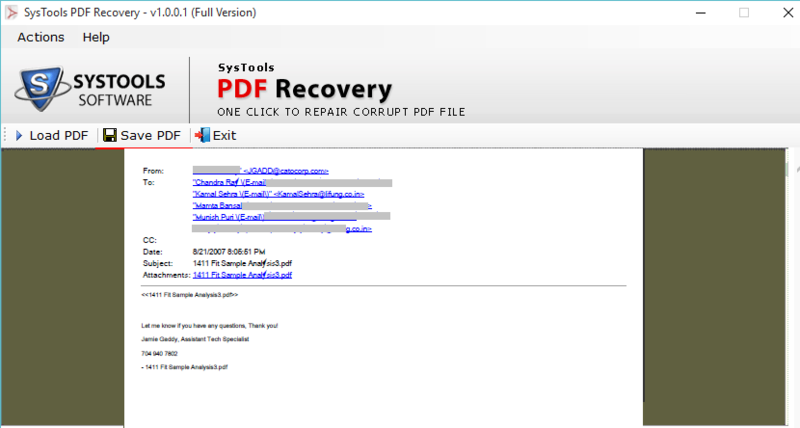 My Adobe PDF file is well formatted and it got corrupt due to virus attack, can I recover PDF file without any changes? Yes,PDF Repair Software will recover corrupt PDF file without any difficulty. Moreover, tool will not make changes in text, image or format. My PDF File partially opens however, I was unable to open PDF file. Please describe the reason behind this problem & what is the maximum file size that could be recovered by this tool? Yes, you can easily recover partially corrupted PDF file with the help of Adobe PDF Recovery tool. Also, there is no file size limitation, you can recover PDF of any size. My PDF File is Password Protected. Can I recover its password by this tool? No, PDF Recovery Tool repair Adobe PDF file data only and to unlock Adobe PDF file you can use our PDF Unlocker Software. Corruption in portable documents made me uncomfortable about proceeding work and at that instant there was an urgent need of a PDF recovery solution. Thankfully I got a reliable tool from PDFWARE solutions. I optimized the application and enjoyed its performance at getting back PDF data. Confronting inaccessibility concern with PDF files proves to be quite irritating as it is just because of having some sort of corruption posing an error that is not easy to tackle manually. At such times it is required to fix PDF files from corruption using PDF Repair Tool. Many of my pdf files got corrupted and these have to be make workable. Tried so many online solutions but thanks to one of my friend who suggested me to try PDF Recovery Software. Thanks to PDF Recovery Tool I was so messed up with my work. Later, found my pdf files got corrupted and they need to be recovered urgently. With this software all pdf files got recovered.